The vast majority of immigrants to Russia are from former Soviet republics, primarily the countries of Central Asia. Last year, only 2.5 million of Russia’s approximately 11 million foreign residents came from countries that had not been part of the Soviet Union. Most of these immigrants are employed in low-skilled labor: 29 percent work in construction and 19 percent work for Russia’s housing services agency, doing jobs such as street sweeping. 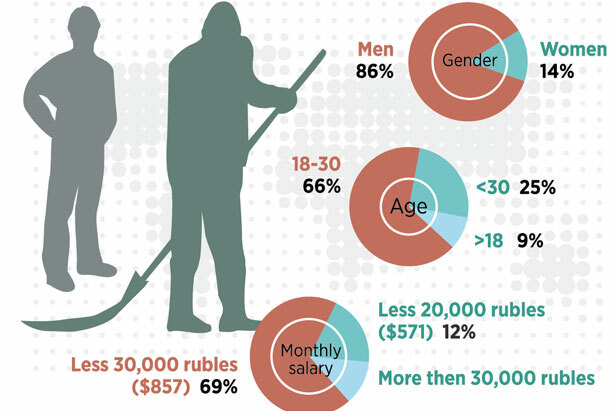 More than 80 percent of them live on salaries of less than 30,000 rubles ($857) per month. Only 6 percent of immigrants have some kind of higher education, and 25 percent did not finish high school.